Week ending 1st February 2019. The media may be obsessed with Brexit, but the market was more interested in this week’s Fed monetary policy meeting and progress on US/China trade talks. I have to admit, I liked everything I heard from the Fed’s first meeting of the year: while I expected the Fed to leave US interest rates unchanged, the Fed Chairman Jay Powell went out of his way to be dovish. He signalled that the current tightening cycle may be over, by saying the Fed will be “patient” on any future moves and said the next move could be either up or down (confirming our long held view that this would be one of the loosest tightening cycles ever – and remember at their last meeting in December, Jay Powell was still indicating that the Fed would increase rates at least twice during 2019). Additionally the central bank said it would be flexible on reducing its balance sheet (the unwinding of QE). And as for this week’s crucial round of US/China trade talks, while there was nothing substantive, there was enough progress to suggest a deal will be reached as China agreed to “substantially” boost imports of US crops, services and energy while also cooperating on IP rights and tech transfers. The final deal now hinges on a meeting between Donald Trump and his Chinese counterpart, Xi Jinping – although no date has yet been set. However, recent data out of China (suggesting their economy is slowing) and soggy earnings from a number of US companies (such as Caterpillar and Nvidia) suggest both sides need a trade deal. And let’s face it, Donald Trump’s recent track record has shown that he does capitulate – so while I don’t want to be complacent, I would imagine he will relax some of his demands and finalise a trade deal with China relatively quickly. In the UK, Parliament was pretty rowdy again on Tuesday (29 January 2019) due to the crucial Brexit votes in Parliament. Theresa May will now head back to Brussels to renegotiate her Brexit deal after MPs backed an amendment to remove the contentious Irish backstop from the Withdrawal Bill. While on the face of it, it looks like ‘mission impossible’ as Donald Tusk, the president of the European Council, immediately said the deal isn’t open to more negotiation (although interestingly, he also said the EU would consider a Brexit extension despite the fact that MPs also voted to reject a delay), personally I think the vote does bolster Theresa May’s hand: either the EU agrees to talk about the backstop in order to avoid a no-deal Brexit (and a no-deal Brexit would be damaging for the EU and especially so for the Irish economy), or MPs are forced to fall into line and back her original Brexit Plan rather than risk a no-deal exit. 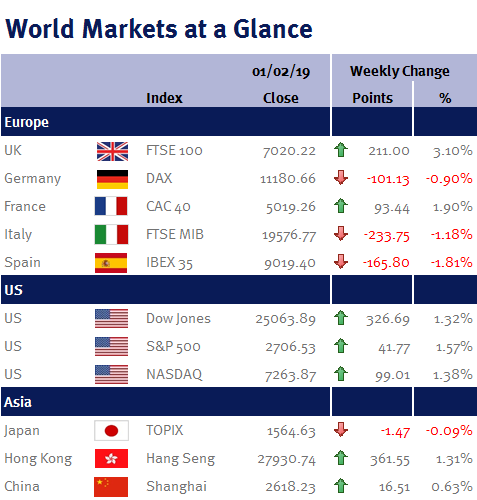 However, as the risk of a no-deal Brexit has ticked up a notch, the pound weakened slightly over the week – although losses were limited given that a Brexit delay also looks inevitable. And a weaker pound is positive for the FTSE-100 (as the majority of the constituents are multinational companies with large exports and overseas revenues). Looking ahead to next week, there are a few major releases to keep an eye on: in the UK we have a BoE monetary policy meeting and inflation report; and in the US we have Q4 GDP and retail sales. Additionally, President Donald Trump will give his State of the Union address on Tuesday (5 February 2019).